Food Notebook: Party Chip Cookies! We threw a surprise birthday party for my dear friend Mich today and Spocky said we should bring "symbolic" gifts to give her for her birthday. Mich had always been a fan of my home made chocolate chip cookies ever since I started bringing a batch of them to school so my symbolic gift of course were cookies. To give the cookies a party-feel to them, I sprinkled colorful candy flower sprinkles on top of each cookie dough mound before baking. 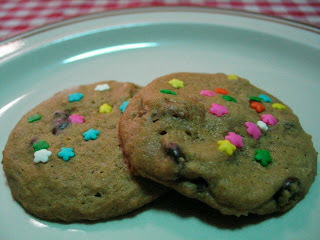 A while back, I made mini-versions of this colorful cookie for Robin's cute little niece. The cookies with the dainty little flowers came out very pretty. They are a hit with the little kids, and the young at heart. That's why I think this idea deserved a repeat performance.